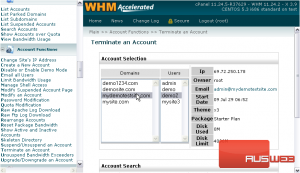 If you no longer wish for an account to reside on your server, you can terminate the account. Be warned that this will permanently delete the account from the server, so this action cannot be undone. 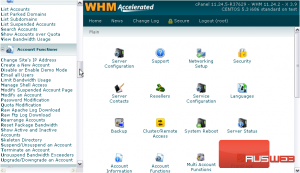 1) Start by navigating to the Account Functions. 2) Then go to Terminate an Account. 3) Select an account using the main domain or user, or search for an account below. 4) If you’d like to keep this account’s DNS Zone, click here. Do not continue unless you’re absolutely sure the account should be terminated and permanently deleted from your server. You will receive no further warnings. 5) Press Terminate when ready. It will take some time for everything to be removed from your server. When finished, you should see an OK message followed by a bunch of checkmarks. Account removal is now complete. Most traces of the account should now be gone from your server. This demonstration is now complete. You now know how to terminate an account and permanently delete it from your WHM server.